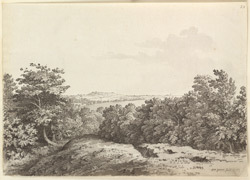 A distant view toward Dundry Tower in Somerset, from the upper Bristol Road near Kelston, drawn in August 1789. The parish of Kelston lies four miles north-west of Bath and eight miles east of Bristol. In the distance is Dundry Hill, a prominent feature in the landscape with steep sides and a broad plateau, dominated by the splendid west tower of St Michael's Church.